Did you know that one of the newest forms of corporate organizations in the United States is the ‘B Corporation’? A ‘B Corporation’, otherwise known as a Benefit Corporation, can be applied to a company that wants to incorporate and adheres to a guideline of socially beneficial practices. In other words, a social enterprise can finally legally incorporate and be recognized for its socially-conscious mandate. It has become more then evident in recent years that there needs to be more guidelines that help define socially responsible business and this is one method to create these criteria. Benefits of becoming a B Corp. include assistance in institutionalizing stakeholder interests, obtaining tax breaks, promotion through the use of the Certified B Corporation brand, discounted tools and services from a network of B Corporation social partners, and a method of constantly reviewing a business’s ethical standards. To learn more about the B Corporation Certification, visit http://www.bcorporation.net/. What a great way to help social entrepreneurs expand their businesses to a larger scale and bring ethical enterprise to a more mainstream audience. A reminder to make sure you follow us on Twitter and become a fan of us on Facebook! We want to hear your comments, views, ideas and support! It was a weekend of glitz, glamour, celebrity and… sustainability? As famous Bollywood film stars rolled in into the city, The International Indian Film Awards rolled out a green carpet. Adopted in 2007, during the IIFA Awards weekend in Yorkshire, England – the green carpet is designed to bring attention to the global issue of climate change. With millions of viewers tuning in from around the world, IIFA aims to create awareness and encourage action leading to sustainable living. In 2007, the awards teamed up with a UK charity Global Cool and in 2007, the event company that puts together the IIFAs launched their own organization, the Green Globe Foundation. Additionally, in the past, IIFA has had entirely carbon-neutral events. This year, Friends of IIFA (a group of film stars) created an official YouTube video to promote the awards’ green agenda and later on, IIFA worked with the UN Environment Programme and many of its famous celebrities to celebrate World Environment Day. So – gorgeous outfits, outstanding performances, blockbuster movies, deserving awards, infamous celebrities and a green agenda. Sounds like a weekend to remember! How to be an ethical shopper on a budget! Shop second-hand or vintage: By shopping second-hand or vintage, you are reducing the amount of products that get disposed and using your consumer “vote” to vote against harmful and unethical consumer product production practices. Buy less pieces but purchase quality, ethical, fair trade or sustainable products: Instead of purchasing multiple “mainstream” consumer products, consider investing in a few key ethical pieces. Learn about where the products you regularly use come from: Being educated is half the battle won. Know about the alternatives and options out there, so that when you or a friend make a purchasing decision, you are making the most educated decision possible. Create an ethical household budget: When planning how much you spend on basic household products, consider accounting of household goods that are environmentally-friendly – a few small purchasing changes might be able to fit into your existing budget! Stop thinking price and start thinking value: As a consumer, you need to stop evaluating the price of every product and start realizing the long-term value of that product instead. The investment you make in the purchase of an ethical product now, will result in a social profit in the future. Your purchase could stop the degradation of the environment, could help an artisan support his family in rising out of poverty and could even allow a community to retain their heritage and craftsmanship. These tips are just some ideas that will enable you to become a more socially-conscious shopper. Integrating fair trade and sustainable products into our daily lives is difficult but not impossible. On our website you will find some great example of socially-conscious fashion that is at a comparative price to mainstream brands. Do your research, learn more about the value of goods, attempt to add ethical products into your purchases, check out some of the amazing second hand and vintage stores around the country and consider how you can change your consumer mentality to support this movement! Any fashionista knows that a big part of seasonal fashion trends are the colours (view our articles here and here), so it is clear to see why colours can often make a fashion conscious consumer fear ethical products. Can a product really be sustainable or fair trade and have the same quality, texture and colour? Check out these products and more on our website, and learn how we aim to provide fashionable ethical products (in all of the season’s colours) to YOU! 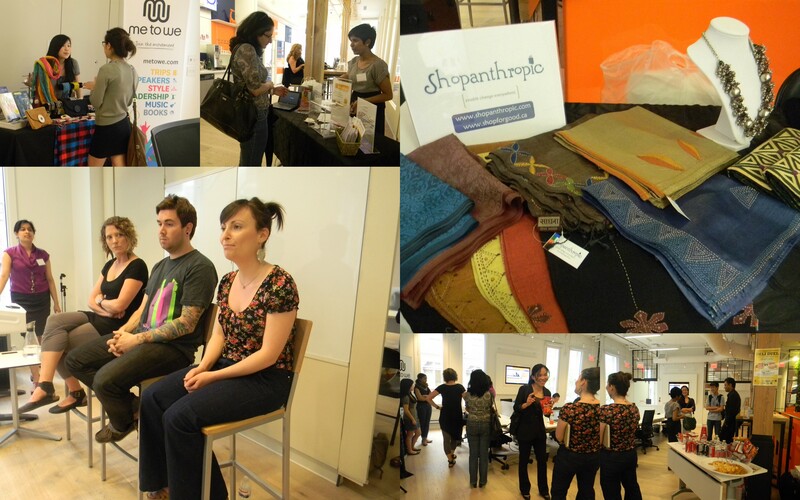 A Review of our #buyethical Event! We shared stories, discussed best practice methods, asked questions, shared laughs and even established some action items. A special thanks to our 3 panelists: Kelly Drennan from Fashion Takes Action, Ryan Bolton from Me to We and Michelle Gruda from ethicalDeal. Thank you to all of those who attended, we hope you had a great evening and we look forward to more events in the future! It’s Here! Our event at ING Direct Cafe today!! We are excited to announced that our first event is taking place today! Ethical & Fair Trade Products in the Marketplace is happening at the ING Direct Cafe on 221 Yonge Street (Toronto) from 5 to 7pm. Does the sector need to look at how traditional retail operates? Do fashion and industry trends need to play a greater part in ethical sourcing of products? What will it take to attract a larger group of consumers to go ethical? You still have time to register for the event! Visit http://ethicalproducts.eventbrite.com/. A new project known as the “Water lily” livelihood project has been launched in the Philippines to make communities more productive through a large microfinance project with 65 cooperatives throughout the city of Butuan. This project consists of training in the art of producing handicrafts such as “bags, hats, slippers, and other native items where the material to be used is “water lily” that can be easily harvested from rivers, creeks, and other waterlogged areas.” Once community members start producing these handicrafts, their products will be sold locally and internationally. Officials say the purpose of this project is to improve living conditions for residents in remote areas. In order to ensure the success and efficiency of project, the funding is only extended to registered cooperatives and coop officers are encouraged to make gradual loan payments so that they avoid future liquidity problems. It is exciting to see a government take action to address poor living conditions in a developing country. A similar project, the “Pangasius” techno-demo pond of Surigao del Sur State University (SDSSU), is being simultaneously launched with the aim of improving the government’s food security program and create better livelihood opportunities for residents of the region. By using local natural materials, working with existing cooperatives, creating contingencies and guidelines, providing apt training and funding and looking for new opportunities to improve the community – the government of the Philippines is certainly paving the way for better communities! We are very excited to be only 2 days from our first event: Ethical & Fair Trade Products in the Marketplace – A discussion & networking evening! We are excited to announce our sponsor Me to We will be featured at a booth at the event! To learn more about the event and register, visit here: http://ethicalproducts.eventbrite.com/. Hope to see you there! Does Social Media Really Drive Social Entrepreneurship? Recently, we stumbled upon a blog post that discussed the value of social media in helping make social entrepreneurship successful. Social Media, which is all about sharing what’s going on with ME, is getting a facelift so that it is about WE. The blog post talked about how platforms like Facebook and Twitter are allowing consumers to voice their socially-conscious concerns globally, and use crowdsourcing to inspire innovation. We live in an age of social – social media has made it infinitely easier to instantly connect, communicate and engage people around the world. Social entrepreneurship is transforming business to be more aware of the needs of people around the world and actively work to engage solutions. That being said, you can find similarities between the two concepts and why social media can be a powerful tool in enabling social change. “Collective Buying” is one of the methods this is done through. By using the power of a group to create positive social change, social entrepreneurs are leveraging social media to enable change. So when you are out there – updating your Foursquare location, sharing 140 characters of your thoughts on Twitter, putting up a great new profile picture on Facebook or utilizing “collective buying” websites such as EthicalDeal – think about how you can use social media to educate, connect, collaborate and enable social change. It might be as simple as sharing a Shopanthropic product that helps artisans around the world or sharing this blog post. Think social. Think entrepreneurial. Think Shopanthropic.